It is about 1pm GMT and I have been surfing the UK web news sites looking for info about the latest disaster to afflict my homeland: the earthquake that hit Christchurch, New Zealand. Most of the newspaper and TV sites have treated the story in the traditional way: the “inverted triangle”, with the intro giving the essential what, where, when information, then crafting the story with more expository material of gradually lessening importance. It’s how I learnt to structure a hard news story all those years ago when I first started out in this craft and it’s the tried and tested way that’s served journalism well for over 100 years now. For some reason, the Guardian website has decided the old way is no good. Its coverage of the story is in the form of a newsblog. We get the who, what, where information as brief bullet points at the top, with the eye-catching photo of the now spire-less Christchurch Cathedral, but what follows has absolutely no structure at all. It’s a mish-mash of baffling tweets, irrelevant musings from the Guardian’s comments, contact details for those who want to find out about loved ones or make donations (including one from the New Zealand Red Cross, who actually says it doesn’t want donations just yet, and another from the Auckland University Students’ Union, the relevance of which escapes me), musings from a boffin at that world renowned centre of earthquake research, Bristol University, and speculation on how the tragedy might affect the Rugby World Cup, due to kick-off in NZ in seven months’ time. Scattered meagrely throughout, like sixpences in a Christmas pudding, are bits of what you and I might call “hard news”. Contrary to early reports of an evacuation, Christchurch hospital remained open, and was operating at full capacity, despite suffering minor structural damage. For students who had returned to school just three weeks ago after the summer break, the impact would be enormous, Rutherford said. I’m sorry, but any decent news editor would have put a big thick line through that. It’s irrelevant, unimportant and distracting. People have died, for the love of God. Manhire then reports that Daniel Tobin, multimedia editor of the Christchurch Press, was out buying lunch when the quake struck. Tobin ran back to the Press office to collect his camera and went back outside to collect chilling footage of the immediate aftermath that has since been viewed around the world. Remember that splendidly-named 90s band Pop Will Eat Itself? Well, in the shiny new world of the Guardian’s rolling newsblog, the Media Will Eat Itself. Well, that’s a blessed relief for Brian Edwards. Just one question, though: who he? I’m a NZer who has been living in the UK or 6 years and am actually flying home to Wellington on Saturday for a wedding. Nothing makes me want to get home to family more than something like this. My heart broke seeing the footage of what the people of Christchurch are going through. And so it goes on. And on. And on. For which, no thanks. There is no structure and therefore no sense, and the effect is of being in the middle of a room full of loud, shouty and excitable people all yelling at once with all the phones ringing, the fire alarm going off and a drunken old boy slurring in your ear about “what it all means.” It really is a bizarre way to run a media circus. I guess what the Guardianistas and their shiny new iPads are trying to do is generate some sort of “news buzz” that allegedly comes from 24 hour rolling news “as seen on TV”, as the ads used to say. The trouble is with trying to emulate 24 hour rolling TV news in this way, the Guardian is merely just repeating all that’s wrong with 24 hour rolling news. And the main problem is that most news does not roll 24 hours. You have the main event (in this case a major earthquake more than 24 hours ago), the immediate aftermath (the rescue attempts, the discovery of deaths and injuries etc) and the slowly evolving denouement (messages of sympathy from Her Maj, the NZ PM and various other politicos and all the rest, the I-was-there-I-saw-it-all-it-was-terrible comments from survivors etc). That’s why the traditional inverted triangle news structure has been tried, tested and still stands. As Churchill said of democracy, it may not be the ideal way to impart news, but it’s the best we’ve got. It’s certainly beats anything else. Certainly it’s better than the nonsensical unstructured jumble that’s on the Guardian Newsblog. I do not know, but I suspect that even as I write the Guardianistas are all patting themselves on the back and congratulating each other on what a splendid, marathon effort they’ve pulled off, with all this radical rewriting of the rules of journalism. Hi john, as a Guardianista who works on our website, I’m bound to disagree. The live blog coverage is only one of the ways that we report an unfolding story online – before 1am we had republished an Associated Press story about Christchurch in the traditional format online, and about an hour later Ben Quinn’s piece for the late editions was online as well. You do point out some issues we have with the structure of live blogging within our current templates though – and I totally accept that it is difficult to quickly glean an overview from a live blog once it has been running for a while. Anyway, I’ve blogged a fuller response. Well, Martin Belham, in a very small way, you’ve kind of proved Louse’s point with the last line of your very pleased-with-itself response blog. Those football minute-by-minutes you link to were, as memory serves, a feature of the 1998 World Cup, yet the one you link to, and claim is the first, is from a good few years later. A really minor point, but instructive enough: you work at the place – why not go and ask the sport desk, throw some proper journalistic shapes, instead of Googling and hoping for the best? I also notice you’ve ignored the major thrust of the argument, that the live blog is full of heat and no light. But you keep on trucking, you’re doing a great job, there are only some minor issues with the current template. Do you all converse in management speak at the Guardian? @ Jock: Yes, that’s exactly my point. The No. 1 priority of journalism is to make sense of the mass of information the world throws at us, to give the reader/viewer/listener a narrative (a “story”) which they can grasp through coherent and ordered use of words, pictures, sound, video and whatever. In other words, to answer those eternal questions of the five Ws and an H.
It’s not that the Guardianblog coverage of this event was uninformative, it’s that it was actually informationally subtractive: you were left asking more questions than were answered. Which makes a mockery of the journalist’s craft. I think the fellows at the Guardian have already answered your criticisms. The live blog is *supposed* to be an unorganized “things as they happen” account to be followed up by thoughtful, organized articles. They are two separate things. To put it into your analogy it is more like the chef telling you what he is doing, step by step, as he does it, followed by the waiter bringing you a meal properly presented on a plate. True, not everyone wants a blow by blow account of their dinner’s preparation, but others would find it fascinating and instructive. If you don’t like the live blog don’t read it. Just wait for the articles. Hi Jock McFitba, you are right, I didn’t initially get the earliest minute-by-minute commentary on the site. I went back to the earliest one that has the minute-by-minute tone metadata on it. Neil McIntosh, who was around at the Guardian when they were first developing them, subsequently directed me to an earlier one – I think this coverage of Inter vs Manchester United is the oldest one still available on the site. It is my policy to correct mistakes with a visible edit and update on my blog, so if you look you’ll see that the post has been updated to reflect that. Why didn’t I go ask the sports desk? Because I was blogging from home in my spare time at night. I’m passionate about my work on the user experience of guardian.co.uk, and I think John makes some interesting points about the live blogging format here, and I wanted to contribute to the discussion. As I said in my blog post, the way the journalists are using live blogging now has far evolved what the CMS tools are capable of doing in terms of publishing, and it is one of the projects that we are working to address – getting the right data model for the content so that it can be displayed more flexibly. It isn’t as if we only cover news with live blogs now, it is an additional type of real-time curation. Clearly it isn’t to the taste of everybody, but the live coverage of Libya and Christchurch yesterday generated nearly half-a-million page views between them. It clearly does suit some of our web audience. Data models? Live blogging has evolved more than CMS tools? Eh? Do you ever read this stuff back and wonder what became of that idealistic young journalist? Did CP Scott die for this? And come on, that “we get lots of hits” argument doesn’t pass muster. You should judge yourself on the quality of your content alone. The Guardian should be above page-impression considerations, but clearly isn’t. I also think it’s very revealing that you quite happily write off your sports report misinformation episode as an excusable byproduct of “passion” and “wanting to contribute to the discussion”. Do you have such a flagrant disregard for the facts when you get similarly excited in the rush to publish in the workplace? This is pretty much the whole point of the initial post, and the one you still seem to be missing. There’s a place for rolling online news, yes. What we’re getting needs some work, though, in more ways than one. It sounds like this kind of online format simply doesn’t suit you. Perhaps you would be better off waiting until the next day and then buying a print newspaper to get a traditional and more structured round-up of what happened? It’s an extension of journalism into a new format, not the “death of journalism”. You’ll still see plenty of inverted pyramids in tomorrow’s newspapers, but for a real-time event this is exactly the kind of thing that can help readers. It’s simply curation, in a river of news format, and it is to be applauded. Try tuning into a popular hashtag on Twitter during a real-time event and you’ll see the need for this format. People want their news served up fresh, and the inverted pyramid is an impossible format unless you have some grasp of the facts, and can order those facts into a nice readable article. Look at Libya… how long will it be before we really know what’s happening, given that there are meant to be no journalists on the ground? Should there be a self-imposed ban on all reporting until all of the facts are verified, and can be placed into a neat upside down pyramid? Surely it’s more important to find new formats – perhaps with appropriate caveats in place – to report rolling news events? Er, yes. Report only facts. I really don’t know what to say. I’m surprised anyone would want to argue anything else. Jock, I think maybe some of your frustration with my response might come from a misunderstanding of my role at The Guardian. Whilst I occasionally blog about technical matters on guardian.co.uk, I’m not a journalist. I’m not embarrassed to mention data models and content management systems, because my job is precisely to deal with them. Just as for print you need someone to design and manage editorial workflow, I design digital systems and the behaviours of our website and mobile apps for users. Many of the issues that yourself and John have raised here come, in my view, not from a failure of journalistic endeavour on the part of the live bloggers, but from a failure of the tools to support what they are trying to achieve. Essentially they are publishing one long article, which incrementally gets bigger, and we display the “blocks” in reverse chronological order. As the content has evolved, that turns out to be quite a crude way of doing micro-blogging, and it means that the flexibility around how the blog can be organised and displayed is limited. I’m certainly not suggesting our live blogs are without flaws. 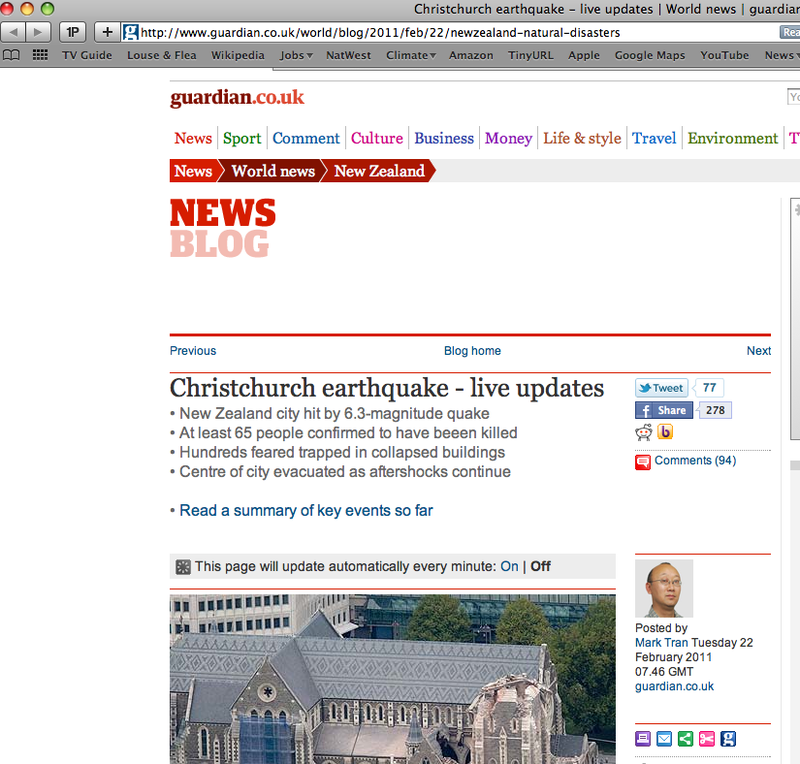 But again, I can only stress, it isn’t as if the Guardian website only does live blogs. Writing about his blogging during last year’s election campaign, Andrew Sparrow suggested that if journalism is the first draft of history, then live blogging is the first draft of journalism. Almost everything that goes into the paper and the bulk of the website conform to the traditional inverted pyramid model – but collating and curating real-time activity on the web around a breaking news story just doesn’t fit into that model. That “we get lots of hits” argument doesn’t pass muster. You should judge yourself on the quality of your content alone. The Guardian should be above page-impression considerations, but clearly isn’t. And come on, that “we get lots of hits” argument doesn’t pass muster. You should judge yourself on the quality of your content alone. The Guardian should be above page-impression considerations, but clearly isn’t.Why didn’t I go ask the sports desk? Because I was blogging from home in my spare time at night. I’m passionate about my work on the user experience of guardian.co.uk, and I think John makes some interesting points about the live blogging format here, and I wanted to contribute to the discussion. Along comes a brilliant new form of journalism that offers more detail, more diverse sources, more context, more material, more immediacy and all this blog can do is show it’s inability to cope with something more sophisticated than a day-old newspaper story. People like it, people benefit from it, the story is told in a rich and interesting way. But you have to whinge about how you can’t cope. If you want more distressing examples of how journalism is leaving you behind, have a look at our report on networked journalism. Cheer up, journalism has always changed and much of it is getting better! He was entirely right. This post truly made my day. You cann’t imagine simply how much time I had spent for this info! Thanks! this to my followers! Exceptional blog and terrific design and style. Are live blogs the future of journalism? Christchurch earthquake Pt 2 Is this OK? I'm a journalist with 30 years' experience in the dead tree and, latterly, online fields. Currently I'm working as a fast, accurate and above all reliable freelance working in both layout (fully tooled up with QuarkXpress and InDesign keyboard shortcuts) and copy editing. Add to that a pub-quiz-busting range of general knowledge, up-to-date knowledge of media law and that I'm usually available at short-notice - but will always consider short-term contracts - and it's obvious there's a lot of bang for your buck on offer here. Download my CV by clicking my pic above.